The G4 from LG will have an improved 5.5-inch, 1440 x 2560-pixel screen. LG has in the last couple of weeks done its best to steal some of the spotlight from already available Android-based smartphones, such as the Samsung Galaxy S6 and HTC's One M9, with a string of teasers and a program to let 4,000 people test the device before launch. The G4 is an important product for LG because the G3 pretty much put the company on the map, according to Ken Hong , global communications director at LG. "We've got to show that we didn't have a fluke with the G3, which was seen as a contender for one of the top five phones that year," he said. The teasers show that LG, like many of its competitors, has focused on improving the screen and the camera. The G4's screen will have the same size and resolution as the G3's, at 5.5 inches and 1440 by 2560 pixels, but will be brighter, with higher contrast, better color reproduction and lower power consumption, the company said. LG also promises a main 16-megapixel camera that takes better images in dark environments. There is a manual mode that lets users control shutter speed and white balance. On the software side, new features include Quick Shot, which lets users take pictures quickly by double-tapping the phone's rear key even while the display is off. One thing LG has yet to confirm is what the G4 will have under the hood. 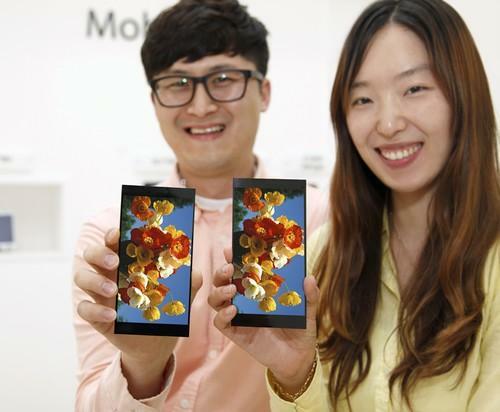 Multiple reports point at the Snapdragon 808 as LG's processor of choice for the device. It uses the same ARM cores as Qualcomm's top model, the Snapdragon 810, but in a different configuration. They both use four Cortex-A53 processor cores, but while the 810 has four Cortex-A57 cores, the 808 has two. The 810 is combined with a more advanced GPU and faster RAM, as well. What this means for real-world performance remains to be seen. It will be interesting to hear how LG explains its choice of processor, and what effect it has on the price tag. When the Snapdragon 810 came under fire for heating issues earlier this year, LG defended the processor, which powers its G Flex2 smartphone. The design of the G4 will also help decide its fate. While most competing devices use metal or a mixture of metal and glass, LG has chosen a different route, showing off a leather back option on the invites to its launch event. Leather is an option on Motorola Mobility's Moto Maker customization service, and Samsung uses faux leather on the back of the Galaxy Note 4. A plastic version of the G4 is expected to be offered as an alternative to the leather back. LG will launch the G4 at events in London, Paris, New York, Seoul, Singapore and Istanbul, highlighting its global ambitions for the device. The G4 is the company's second high-end smartphone this year, following the launch of the G Flex2, and more are on the way. "We've already mentioned publicly that we're working on other premium phones. So if one particular model isn't to your liking, that's fine. There's more down the road. Our strategy of promoting more than one major product will continue," Hong said.